for they are cut off from your hand (Ps 88:4-5). Individuals grieving the loss of a loved one from suicide often need help from a qualified and experienced counseling professional, too. And they also need spiritual guidance and support. But the call to pray with someone who has suffered such a loss can be terrifying. What does it mean that a beloved friend or family member has seemingly made a choice against life, has taken action in a way that violates the basic human instinct in favor of self-preservation? A parent has died, rather than persevere to care for a child; a child has ended a life that his or her parents and grandparents cherish far more than their own; a sibling has communicated to brothers and sisters that their shared life experience is not worth sustaining. Those who die by suicide do terrible violence to their bodies; they often die alone and in deep psychic pain. The horror of the event is indescribable. The anguish and guilt experienced by those left behind render them inconsolable. How in the world can you pray with someone who feels, every day, that she has been rejected and forsaken by a loved one and, quite possibly, by God as well, or that he has been flung into the endless depths of a dark well of despair? It can help to learn something about suicide loss before trying to pray with someone who has experienced it firsthand. It can help to know that experts estimate that 90 percent of deaths by suicide are a consequence of undiagnosed and/or untreated mental illness. Excepting those making considered decisions in response to life-diminishing illnesses, people do not “choose” to die, nor do they choose to hurt or damage those they love. They have not “committed” a crime. People who die by suicide are trying to end intolerable pain. It can help to realize that survivors will bump into the stigma of suicide where they least expect it—a refusal to conduct a funeral, avoidance by acquaintances in the street, intimations that they are to blame. It can help to know they are often angered and hurt by the responses of others. Praying with someone about loss from suicide is not the time for casual platitudes about God’s plan or God’s supposed need for another angel in heaven. It is most especially not a time to try to tell a survivor—someone who has lived through a loved one’s death by suicide—those often misquoted words, “God never gives us more than we can handle” (erroneously based on 1 Corinthians 10:13, which specifically addresses temptation to sin, not endurance of grief). To say in these circumstances that God is implicated in some sort of test of one’s capacity for managing traumatic experiences may result in the suicide survivor’s further dismay and alienation from God. Neither is it the time to say, “I know how you feel,” since (unless you yourself are a survivor) you do not know, nor to say, “I can’t imagine.” The latter comment establishes a barrier between you and someone who already feels isolated from others, and it conveys a sense that what has happened is so awful that you cannot bear to enter into the experience even as a companion. Prayer with a person experiencing loss from suicide is a time to listen, to sit still, and to be present. It is a time to make space for expressions of rage, of agony, of astonishment, and of rejection of faith. It is a time to make it possible for stories to be told about loved ones now gone. “Tell me what your mother is like.” “What is one of your favorite memories?” You might ask someone how he or she imagines the moments after the loved one’s death. You do not have to find those ideas compatible with your own or give a lecture about Christian doctrine—your call is to offer the survivor the gift of attentive listening. It can be difficult to remember that companionship and prayer in silence can be much more effective than words, no matter how eloquent, when the unthinkable has happened. 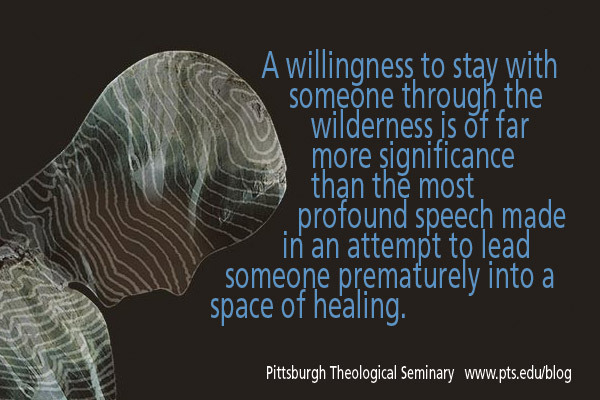 A willingness to stay with someone through the wilderness is of far more significance than the most profound speech made in an attempt to lead someone prematurely into a space of healing. Suicide survivors are living the consequences of a loved one’s having reached a point beyond what was tolerable, but the loved one’s arrival at that destination was not the work of God. The scriptural path for survivors of suicide leads, I think, toward Romans 8:38-39 and Revelation 21:4—passages well worth sharing with someone who has known this loss, though even these passages may be too much for a survivor to bear at first. When the immediate experience of catastrophe passes, those left behind encounter the crushing realization that their loved one died with a wearying and excruciating sense of emptiness and separation from God, from love—from however their loved one might have characterized the Holy in his or her life. Our hope can be that, someday, the survivor(s) of suicide with whom you are praying will gain confidence in the assurance that, appearances to the contrary, there can be no separation from the love of God—that there will, indeed, be a New Creation in which God will wipe away every tear, and “mourning and crying and pain will be no more.” We cannot force fractured spirits into such a conviction, but we can be present to them in the knowledge that our simple availability will be a prayer in itself. O God, from whom nothing can ever separate us, my dearest (name of suicide survivor) is in your hands. Surround him/her with the light of your love and with assurances of love and safety. Help him/her to find a way to live again and to know that, even in the most desperate of situations and most disastrous of events, you are there—unseen and unheard, perhaps, but nevertheless present and active in our broken and hurting lives. These requests I make in the name of the One who came that we might live anew. Amen. The Rev. Mary Robin Craig ’10 earned her master of divinity degree from Pittsburgh Theological Seminary. She now serves as a pastor, spiritual director, and suicide prevention/mental health advocate. This article also appears in Pittsburgh Theological Seminary complimentary downloadable resource “Praying with Others through the Challenges of Life.” This multi-part resource is written by faculty, program directors, and alums of Pittsburgh Seminary. Topics range from dying without knowing God to injustice to pregnancy issues, anger and violence, and anxiety. Download the prayer resource now.